Think you are ready to harness data to make better decisions? This exciting opportunity is a collaborative effort between the Kelley School of Business, Allitix Consulting and Anaplan. You will learn the basics of Anaplan and have the opportunity to gain hands-on training and earning a career impacting sought after credential. Presented by: As a part of this opportunity, you will have a 45-day access to an Anaplan Workspace and training which will give you the resources needed to earn an Anaplan Certificate. Getting Started with Anaplan Step 1: Getting Anaplan access to get your individual workspace. You must email noelle.murphy@anaplan.com to request access. Within 48 business hours, you will be sent an email from Anaplan (no-reply@anaplan.com) giving you instructions on how to get started. Step 2: Setting up your Access to the Anaplan Community Step 3: Setting up your Anaplan Environment (Workspace) Step 4: Starting Your Anaplan Training Here you will be given detailed instructions on how to access the learning center. You will not be able to access all these courses until you have complete steps 1,2, and 3 above. Recommended courses are as follows: 100: Customer Orientation (40 minutes) 101: Foundations (25 minutes) 102: Introduction to Model Building (est. 15-25 hours) - You will earn your Anaplan Certificate 201: Intermediate Model Building (est 6-9 hours) Learn more about Anaplan Learn about Anaplan Learn how our customers are using Anaplan Learn about Anaplan Careers Learn more about Allitix Learn about Allitix Consulting Learn how Allitix Assisted with Cerner’s Anaplan implementation for its core FP&A process Learn about Allitix Career *Interested in getting Anaplan incorporated into other university classes? Reach out to Noelle.murphy@anaplan.com to express interest. Our Story Founded in York, UK and now headquartered in San Francisco, Anaplan has offices all over the world. In fact, we may be the most successful company you’ve never heard of. We are on a mission to revolutionize how companies analyze and plan their businesses. And it’s working - we are already trusted by hundreds of Fortune 2000 companies, and we’ve only just begun. The Anaplan Platform Anaplan’s cloud planning platform enables an organization to run virtually any planning process by connecting data, people, and plans in every part of a business. Connected Planning can be achieved at any scale—from a single use case within one business unit to enterprise-wide connected planning across hundreds of processes, and everything in between. Anaplan’s platform is the most flexible, scalable, and collaborative cloud planning system in the world today. Customer Stories Learn how our customers are changing how they do business. Community Find answers, share solutions, and connect with Anaplan users and planning thought leaders from around the world. Anapedia Review the official documentation of the Anaplan platform. Upcoming Webinars and Events Check out our upcoming events and webinars. Anaplan in the News Learn how Anaplan is driving a new age of connected planning for large and fast-growing organizations. Anaplan Careers Love the freedom to be you? Build your dream job in a place that loves innovation and lives and breathes its core values: Collaboration, Authenticity, Openness, Inclusiveness, and Creativity. 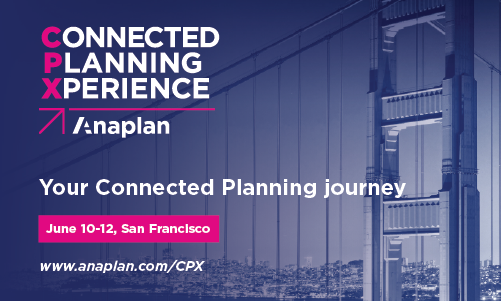 Our Partners At Anaplan, we believe that partners play an essential role in helping customers along the connected planning journey. The way we do business with our partners, and the deep, trusting relationships we form with them, reflects our unwavering focus on our customers’ success. Getting Started What are the costs associated with participating in the University Connect Program? The program is entirely free. There are zero costs to the student and/or university. Anaplan strongly believes in the benefits of investing in our future generations of leaders and business professionals. How can I get my university involved? Have your instructor reach out to use to discuss the most appropriate partnership for his or her course. If my university doesn't have a current partnership can I still get involved? Absolutely! We can get you set up as an individual student learner. Contact us at universityconnect@anaplan.com for more information Curriculum What is the Individual student curriculum? You will gain access to our on-demand model building training. What curriculum is offered for partnering universities? Each university may have a unique approach to how Anaplan is incorporated into their courses and projects. Student Ambassador Program What is an Anaplan Student Ambassador? The Student Ambassador Program is a leadership opportunity for students who are interested in representing Anaplan on campus and at local events. If you are passionate about technology and like to speak about it, this is the opportunity for you. What does an Anaplan Student Ambassador do? You will be expected to learn an expanded knowledge of Anaplan, assist Anaplan during university events, create Anaplan awareness and excitement on campus, attend local Anaplan events and customer user groups, earn the Anaplan Student Ambassador certificate and be featured on our community site as an Anaplan Student Ambassador. How do I become an Anaplan Student Ambassador? We are looking for self-motivated student Ambassadors to join our growing team. At Anaplan we believe in hard work, having fun and bringing excellence to everything we do. If this is you, fill out the online application. Still have questions? Contact us at universityconnect@anaplan.com for more answers to your frequently asked questions. StarterPlan lets you get started quickly and effectively. ExpandedPlan offers extra licenses, structure, support, and workspace for larger partnerships, and CustomPlan allows you to design the partnership to meet your exact needs. Each partnership is designed to be dynamic, collaborative and easily incorporated into your university. See which path is right for you. STARTERPlan EXPANDEDPlan CUSTOMPlan Up to 50 Licenses Up to 200 Licenses Customizable Licenses 500 MB Anaplan Workspace 16 GB Anaplan Workspace Customizable Anaplan Workspace Online Support Online and In-Person Support Support Provided to Fit Your Needs FP&A Learning Track FP&A + 2 Additional Learning Tracks Learning Tracks You Design STARTERPlan: Quick. Effective. Impactful. With StarterPlan, you can quickly get your university started with building the skills they need to be digitally competitive. You get to decide your target due dates for each step through the learning process and from start to finish you will have access to Anaplan support through online resources, email, and phone support. EXPANDEDPlan: Dynamic. Collaborative. Intelligent. With ExpandedPlan, you can easily connect your curriculum with the Anaplan platform. From start to finish you will have access to Anaplan experts, office hours, support through online resources, email and phone support to help you meet your targeted goals. Students learn by solving an FP&A, Supply Chain and Marketing case study. Through this process, learners will demonstrate competencies by applying knowledge to every day, professional situations. CUSTOMPlan: Creative. Flexible. Inovative. With CustomPlan, you create the program that works best for your students and your university. With our support, you define the program, curriculum, and outcome and we'll be there to support you from start to finish. Let Us Support You We can help you navigate Anaplan’s online learning environment and assist you with any technical issues. Learner support includes: A self-paced online orientation that introduces you to Anaplan’s online learning path Technical support Online support blogs FAQs Email and phone support Support in accessing other Anaplan resources Let Us Guide You Registration – As you begin your learning path, our Anaplan experts are here to guide you by providing information about the courses, the online learning experience, and Anaplan careers. Learning Path - We will provide you with a recommended learning path and course sequence to keep your students on track to success. Let Us Share Our Resources Anaplan Community Anapedia Call 651.428.1746 or email universityconnect@anaplan.com to speak with a program manager to learn more about partnerships and learning paths. Explore Programs Teach Anaplan in the Classroom Become a certified Anaplanner, and gain the skills and knowledge to teach the platform in your classroom. Follow learning paths designed to equip you with knowledge of the Anaplan product, structure, and processes. Workshops & Class Projects We design short- and long-term projects, which can be incorporated in or outside of the classroom, that give students the skills necessary for careers in today’s rapidly changing business world. Students conduct research, analyze data, build multidimensional models, and work to solve complex problems in business planning. Hack-a-thons Help prepare your students to participate in an Anaplan hackathon. We will propose a business challenge and your students compete with other students to find the most desirable unique solution using the Anaplan platform.